Let’s welcome the month of hearts and the arts! 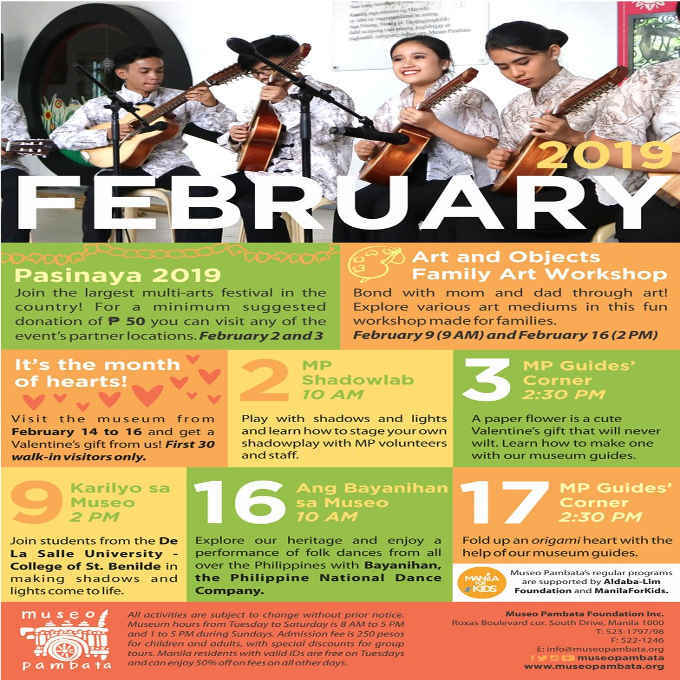 Take a look at Museo Pambata’s line-up of activities for February. Join the largest multi-arts festival in the country, for a minimum suggested donation of Php 50 you can visit any of the event’s partner locations. A paper flower is a cute valentine’s gift that will never wilt. Learn how to make one with museum guides. Bond with mom and dad through art. Explore various art mediums in this fun workshop made for families. Join students from the De La Salle University – College of St.Benilde in making shadows and lights come to life. Visit the museum from February 14 to 16 and get a Valentine’s gift. First 30 walk-in visitors only. Explore Museo Pambata heritage and enjoy performance of folk dances from all over the Philippines with Bayanihan, The Philippine National Dance Company. Fold up an origami heart with the help of museum guides. Museo Pambata’s regular programs are supported by Aldaba-Lim Foundation and ManilaForKids. Note: All activities are subject to change without prior notice. Museum hours from Tuesday to Saturday is 8 AM to 5 PM and 1 to 5 PM during Sundays. Admission fee is 250 pesos for children and adults, with special discounts for group tours. Manila residents with with valid IDs are free on Tuesdays and can enjoy 50% off on fees on all other days.